Please credit all usage to — CNN’s The Lead with Jake Tapper. JAKE TAPPER, HOST: Thanks for doing this, Mr. President. BARACK OBAMA, PRESIDENT OF THE UNITED STATES: Great to be with you, Jake. TAPPER: So your big push in the State of the Union and here is whatever you cannot accomplish with Congress, you will take executive action or issue executive orders. How much can you really accomplish doing that? OBAMA: Well, first of all, my big push is making sure we’re focused on opportunity, making sure that every single day, all of us in Washington are trying to think about ways that we can help folks get good jobs, make sure that they’re trained for the good jobs that are out there, make sure that those jobs pay, make sure our kids are getting a great education. Those are the issues that the American people still, you know, very much are concerned about. TAPPER: You don’t seem confident that that’s going to happen, though. TAPPER: Oh, I don’t mean immigration reform, I mean the jobs issue, though. OBAMA: I — I think there are going to be some issues where it’s going to be tough for them to move forward. And I am going to continue to reach out to them and say here are my best ideas, I want to hear yours. But, as I said at the State of the Union, I can’t wait. And the American people, more importantly, cannot wait. So when, for example, yesterday I signed an executive order helping to set up starter retirement accounts for folks who may not have retirement accounts on the job it is not as big as if we change — overhaul our tax code so that we’re providing more incentives for working families to save, the same kinds of incentives that folks at the very top have, but it’s still significant. It still makes a difference. And what we’re doing here today, talking about job training — we actually already have a lot of resources for job training. The problem is, it’s not well coordinated and oftentimes it’s not funneled to those programs that are allowing companies to help, maybe colleges, let’s say, design the training so that somebody who goes through it knows they’re going to get a job at the other end of it. Tomorrow is a great example of something that we’re doing that doesn’t involve any legislation or funding. We know that one of the biggest problems right now in the jobs market is the long-term unemployed. TAPPER: — because they’ve been unemployed so long. OBAMA: — because they’ve been employed — unemployed so long folks are looking at that gap in the resume and they’re weeding them out before these folks even get a chance for an interview. So what we have done is to gather together 300 companies, just to start with, including some of the top 50 companies in the country, companies like Walmart and Apple, Ford and others, to say let’s establish best practices. Do not screen people out of the hiring process just because they’ve been out of work for a long time. We just went through the worst recession since the Great Depression. And so I’ll be convening a meeting where a number of these top companies will be coming in, agreeing to these best practices. And we’ll have an opportunity to you know, encourage more people to come in. All those things cumulatively are going to have an impact. Will we be able to have more of an impact if we can get Congress, for example, to pass a minimum wage law that applies to everybody, as opposed to me just through executive order making sure that folks who are contractors to the federal government have to pay a minimum wage? Absolutely. And that’s why I’m going to keep on reaching out to them. But I’m not going to wait for them. TAPPER: Your critics say this is diminished expectations. And I’ve been covering you for a long, long time, as you remember, 2005, 2006 in the Senate. I remember during the campaign when you talked about your presidency being a moment when the rise of the oceans would slow and the nation and the world would heel. And now you’re talking about pen and phone and executive orders and executive actions. Do you think you were naive back then or have you recalibrated your expectations and your ambitions? OBAMA: Well, part of it is we got a lot of that stuff done. We’ve got in this country, a health care reform that has already signed up millions of people and make sure that everybody who is watching, anybody who already has insurance, will not be dropped because of a pre-existing condition. And if they don’t have health insurance, they can get it on HealthCare.gov. We have made enormous strides on the education front, changing our student loan programs. And millions more young people get student loans. And so part of what’s happened is that checklist that I had when I came into office, we have passed a lot of that and we’re implementing a lot of it. Where we haven’t, we’ve taken some administrative actions. So on climate change, which has to be a top priority for all of us we are going to make sure that one of the biggest sources of the pollutants that are causing climate change are regulated by regulations on exist power plants. And that’s a big piece of business. And so in no way are my expectations diminished, or my ambitions diminished, but what is obviously true is we’ve got divided government right now. The House Republicans, in particular, have had difficulty rallying around any agenda, much less mine. And in that kind of environment, what I don’t want is the American people to think that the only way for us to make big change is through legislation. We’ve all got to work together to continue to provide opportunity for the next generation. TAPPER: And let’s talk about House Republicans, because — and — and Senate Republicans. There has been a large contingency of Republicans critical of your new approach. Senator Ted Cruz of Texas, who might run for president, calls this the imperial presidency. And in the House, there is this thing, as you know, called The Stop Act. They want to rein in what you’re trying to do. How do you respond to that? OBAMA: Well, I don’t think that’s very serious. I mean, the truth of the matter is, is that every president engages in executive actions. In fact, we’ve been very disciplined and sparing in terms of the executive actions that we have taken. We make sure that we’re doing it within the authority that we have under statute. But I am not going to make an apology for saying that if I can help middle class families and folks who are working hard to try to get in the middle class do a little bit better, then I’m going to do it. And, you know, I think it’s — it’s a tough argument for the other side to make that not only are they willing to do an — not do anything, but they also want me not to do anything in which case I think the American people who’s, right now, estimation of Congress is already pretty low might might have an even lower opinion. TAPPER: The Stop Act is not something you take seriously? OBAMA: I — I am not particularly worried about it. TAPPER: Let’s talk about areas where you might be able to make some progress. TAPPER: I know that a pathway to citizenship and immigration reform is very important to you. And it’s very important to Democrats and others. It’s possible that you might be able to get an immigration reform bill on your desk that has legal status for the millions of undocumented workers who are in this country, but not citizenship. OBAMA: Well, you know, I’m not going to prejudge what gets to my desk. TAPPER: — is that principle? OBAMA: Well, I think the principle that we don’t want two classes of people in America is a principle that a lot of people agree with, not just me and not just Democrats. But I am encouraged by, you know, what Speaker Boehner has said. Obviously, I was encouraged by the bipartisan bill that passed out of the Senate. I genuinely believe that Speaker Boehner and a number of House Republicans, folks like Paul Ryan, really do want to get a serious immigration reform bill done. And keep in mind that the Senate bill and the legislation that I’ve supported already calls for a very long process of earning citizenship. You had to pay fines. You had to learn English. You had to pay back taxes. And you had to go to the back of the line. And at the end of that, you could get citizenship. If the speaker proposes something that says right away, folks aren’t being deported, families aren’t being separated, we’re able to attract top young students to provide the skills or start businesses here and then there’s a regular process of citizenship, I’m not sure how wide the divide ends up being. That’s why I’d want to prejudge it. What I’m encouraged by is the fact that that Speaker Boehner and others seem to recognize our country will be stronger if we are able to resolve this issue in a way where, you know, kids, for example, who have grown up here and for all practical purposes, are Americans but don’t have the right papers are not being punished. TAPPER: — in the way that you seemed to when we were — when you were passing health care reform and I was covering it, the public option. In other words, it would be great, in your view, if you could do it. It’s not going to happen and there might be some expectation setting you have to do because I — having reported on this, I don’t think House Republicans can pass anything that has a pathway to citizenship. OBAMA: Well, here — here’s the good news, though. Number one there is a desire to get it done. And that, particularly in this Congress, is a huge piece of business, because they haven’t gotten a lot done over the last couple of years out of the House Republican Caucus. They — they’ve been willing to say what they’re against, not so much what they’re for. The fact that they’re for something, I think, is progress. The second thing here, though, I want to make sure that I’m not just making decisions, that — about what makes sense or not. We’re going to be consulting with the people who stand to be affected themselves. The — not just the immigrant — immigration rights groups and organizations and advocates, but also ordinary folks. What is it that they’re looking for? What do they aspire to? And, you know, this is something that — where you’ve got to have a serious conversation around the country. I do know that for a lot of families the fear of deportation is one of the biggest concerns that they’ve got. And that’s why we took executive actions given my prosecutorial discretion, to make sure we’re not deporting kids who grew up here and are Americans for all practical purposes. But we need to get that codified. And the question is, are — is there more that we can do in this legislation that gets both Democratic and Republican support, but solves these broader problems, including strengthening borders and making sure that we have a legal immigration system that works better than it currently does. TAPPER: Another big issue in this country right now has to do with the legalization of marijuana. You gave an interview to “The New Yorker’s” David Remnick and you said that you thought smoking pot was a bad habit, but you didn’t think it was any worse for a person than drinking. Now, that contradicts the official Obama administration policy, both on the Web site of the Office of National Drug Control Policy and also the fact that marijuana is considered a Schedule One narcotic, along with heroin and Ecstasy. Or are you considering not making marijuana a Schedule One narcotic? TAPPER: Would you support that move? OBAMA: But the broader point, I stand by my belief, based, I think, on the scientific evidence, that marijuana, for casual users, individual users, is subject to abuse, just like alcohol is and should be treated as a public health problem and challenge. But as I said in the interview, my concern is when you end up having very heavy criminal penalties for individual users that have been applied unevenly and in some cases with a racial disparity. I think that is a problem. We’re going to see what happens in the experiments in Colorado and Washington. The Department of Justice, you know, under Eric Holder, has said that we are going to continue to enforce federal laws. But in those states, we recognize that we don’t have the — the resources, the federal government doesn’t have the resources to police whether somebody is smoking a joint on a corner. And we are trying to provide them structures to make sure that, you know, big time drug traffickers, the spillover effect of the violence, potentially, of a drug trade are not creeping out of this experiment with — that is taking place. Over the long-term, what I believe is if we can deal with some of the criminal penalty issues, then we can really tackle what is a problem not just for marijuana, but also alcohol, also cigarettes, also harder drugs, and that is, try to make sure that our kids don’t get don’t get into these habits in the first place. And, you know, the incarceration model that we’ve taken particularly around marijuana, does not seem to have produced the kinds of results that we’ve set. OBAMA: — are going to be higher. When your director of National Intelligence General James Clapper testified before Congress and said, before the Snowden leaks, that there were no mass surveillance going on a lot of Democrats in the Senate think that he was not honest. He said like — later, that it was the least untruthful answer he could give. I know that you have faith in Clapper. I know that you believe that these programs protect the American people. But I can’t believe that you weren’t disappointed by his answer, because least untruthful is not a phrase I remember hearing on the campaign trail. TAPPER: So you understand what he did? 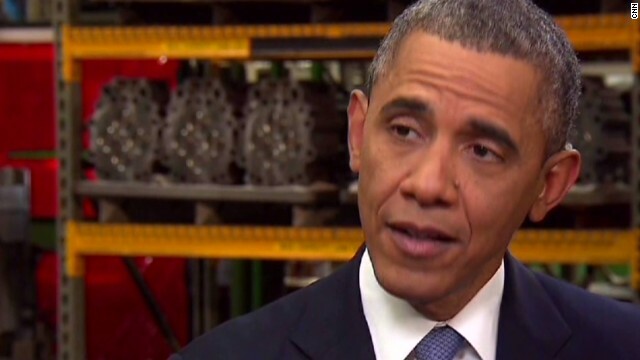 OBAMA: Subsequently, I think he’s acknowledged that he could have handled it better. He’s spoken to Mr. Wyden, who’s — personally. I think the — the broader point is that everybody that I’ve dealt with in our intelligence community is really working hard to try to do a very tough job to protect us when there are constant threat streams coming at us, but doing so in a way that’s consistent with the law and is consistent with our constitution and consistent with our privacy rights. And as I said in the speech that I gave a couple of weeks ago, what’s clear is that we are going to have to do a better job of being transparent about what we do, to have a robust public debate about what we do. I am actually confident that we can continue to have the best intelligence service in the world, but win back the confidence of both the American people, as well as folks oversees. But it’s going to take some time. It’s going to take some work, partly because the technology has just moved so quickly that the discussions that — that need to be had didn’t happen fast enough, didn’t happen on the front end. And, you know, I think that we have the opportunity now to move forward in a way that is going to make a difference. A lot of members of Congress and not just like the fringe ones, the ones who actually are serious lawmakers, have said to CNN that they would not let their family members to go Sochi, that they are not confident that it will be safe. You see all the intelligence. TAPPER: I know that you’re not going. I know Michelle and Sasha and Malia are not going. But if close friends of yours, or close friends of the girls’, said, hey, we’re thinking about going, what would you tell them? OBAMA: I’d tell them that I believe that Sochi is safe and that there are always some risks in these large international gatherings. I’m always going to feel even better if the — inside the United States, because then we have full control over what happens. But the — the Russian authorities understand the stakes here. They understand that there are potential threats that are out there. And we are coordinating with them. We’ve looked at their plans. I think we have a good sense of the — the security that they’re putting in place to protect not only the athletes themselves, but also visitors there. So what I would say is is that if you want to go to the Olympics, you should go to the Olympics. And you know, we’re not discouraging, in any way, Americans from participating in what is just always an amazing, wonderful event. In these large settings like this, there are always some risk involved. And I don’t want to completely discount those, but as we’ve seen here in the United States and, you know, at the Boston Marathon, I mean there were — there were some risks if you have lone wolfs or small cells of folks who are trying to do some damage. And I think that it’s very important for anybody who’s attending the Olympics to get in contact with our State Department, get on the Web site, look at what kinds of just prudent measures you should take that wouldn’t necessarily be unique to Sochi. That — that is something that we would advise any time you’re involved in a — a big international event like this. TAPPER: At the State of the Union, I felt, was a very moving and important moment. And what I admired about it was the nation, so many times, doesn’t seem to want to know the costs of war and seeing him and his struggle, I thought, was very important for the country to see. OBAMA: The biggest honor I have is serving as commander-in-chief. And you meet these amazing people every single day. But they’re carrying a big burden. And, you know, on the one hand, we’ve got this all volunteer army that makes it outstanding. These are people who want to serve, who are eager to serve, who are trained to serve. We’ve never had a better military in our history. But it also means only 1 percent of the American people are in harm’s way. And their families are the ones who are bearing that burden, which means that when we make decisions about war it is that much more important for lawmakers and the president to understand that there are consequences to this. And, I think, you know, folks like Corey are the first ones to say we volunteer because we want to defend this country. And what we accomplished in Afghanistan in terms of pushing back the core of al Qaeda has been critical to our national security. But as I said at the State of the Union I am not, as commander-in-chief, going to be sending our young men and women into open-ended conflicts or deploying our troops in large numbers overseas without thinking about folks like Corey before I send them. And, you know, it’s the most profound, solemn decision that any president makes. I’m sure that was true for all my predecessors and will be true for my successors. All of us as Americans, have to just keep that in mind, that that just because there isn’t a draft and just because this is an all volunteer army that the burdens that are being carried by this small group of Americans is profound and we owe them thanks. We owe them all the support they deserve once it’s over. TAPPER: Thank you for your time, sir. TAPPER: I really appreciate it. TAPPER: So the first Lady just gave an interview and said that your daughters, no so concerned whether you had a bad 2013 more concerned about ok Dad that’s great where’s my allowance. OBAMA:You know they, when we sit down at the dinner table, have some awareness of what’s going on. And we have great conversations although mostly it’s about history than about what’s going on right now. But it’s true, look they’re teenagers, they’re fully absorbed with their lives, what’s going on at school. TAPPER: They’re not into your approval ratings? TAPPER: Are you bringing them to the Vatican for when you meet the Pope? Are they going to come? OBAMA: You know they met the previous pope, the last one. But I’m not sure they’re going to have a chance to go this time. It was wonderful great story. Sasha was still pretty young at the time, it was my first year in office and they see the Sistene Chapel and they’re going through the various chambers, each time she’d she somebody dressed up in the cloth she’d say ‘Is that the pope? Is that the pope?’ How bout that guy over there?’ No no you’ll know when it is finally the pope. TAPPER: I was thinking about this pope and there’s so much excitement that he’s going to change everything. You want to talk to him about managing expectations at all is that something he needs to think about? OBAMA: I have been really impressed so far with the way he has communicated what I think is the essence of the Christian faith and that is a true sense of brotherhood and sisterhood and a true sense of regard for those who are less fortunate. My suspicion is based on what I’ve seen of him so far, he’s a pretty steady guy. I don’t think he needs any advice from me on staying humble. TAPPER: He’s not worrying about his approval ratings? OBAMA: I don’t think he is. I think he is someone who is very much focused on his faith and what he needs to do to make sure that folks not just in the Catholic faith, but people all over the world are living out the message that he thinks are consistent with the lessons of Jesus Christ so I’ve really been impressed with him so far. TAPPER: So big game this Sunday. I wonder what you made of the Richard Sherman kerfuffle. His sideline rant, the push back, the push back to the push back, his argument that calling him a thug was just a more polite version of calling him the n word what did you think of the whole thing? TAPPER :So it’s just that tradition. OBAMA: SO I think it’s part of that tradition of you know let me get some attention, obviously it’s worked. I suspect he’s going to have a lot more endorsement contracts and I think more jersey sales after that. It’s going to be a great game. You’ve got Peyton Manning who may be he’s had the greatest season any Quarterback has any had and to watch him go against a team that is known for it’s defense, and particularly it’s passing defense, I think means there’s going to be some excitement there. TAPPER: I’m going to give you a choice. I’m going to give you two. Hillary verus Biden or Broncos verus Sea Hawks. You have to pick one and give me the winner. TAPPER: So you’re going with that one. OBAMA : Surprisingly enough. I think it’s going to be a lot like the Sea Hawks 49ers game. I think it’s going to come down to the last play and I think um in the end of the day…I’m not going to pick because I don’t want to offend any of the great cities participating. TAPPER: OK so you’ll go with Hillary vs. Biden then. OBAMA: I’m too smart for that Jake. Come on man. I love the state of Washington and I love the state of Colorado. TAPPER: Come on you’re not running for anything else anymore. You won them both.